I decided that the time was right to talk about one of the most asked questions that I hear. Before I get into the meat of this post I want to be clear on a few points. I generally steer clear of discussions related to the financial costs associated with creating my style of art. The bottom line is that creating palladium prints on Japanese gampi tissue from large format negatives is inherently expensive. The richest man to grave will never win this race. Secondly, this is not another film vs. digital debate. That ship sailed and is currently enjoying a fruitful existence. Many photographers shoot digital for a living and film for fun. This is more about why I prefer to shoot film instead of using digital cameras. I have no hatred toward digital cameras. They have a place and purpose in the world of photography. Digital cameras have come a very long way. Many of the shortcomings of digital capture have been overcome, yet there are still some fundamental problems to solve. The single most glaring problem for me is the price tag slapped on the higher end digital systems. I’ll go ahead and use the Hasselblad H6D-100c medium format DSLR camera as an example. Hasselblad is one of the best camera makers in the world. The Hasselblad H6D is a 100 mega pixel digital back fitted to a medium format camera. The features of the camera are well beyond the main topic of why I shoot film. To be fair, I’ll compare shooting with large format color sheet film vs. using the Hasselblad. My go to film is black and white. I’ll step back and compare color film as color images are vastly more popular than black and white. Color transparency film (color slide) is arguably the best color film on the planet. The current price for 8x10 color transparency film is $13.50 per sheet. Shooting with transparency film involves bracketing, or varying the amount of light hitting the film. Typically the film is exposed 1/3 of an f-stop over, 1/3 under and one stop on the correct meter reading. That brings the total to $40.50 for one image. Now I ship the film to my trusty lab to be developed. That will average around $10.00 per sheet. The total so far is now $70.50 for one shot. Now comes the scan. I’ll keep things simple with a 2,400 dpi scan. That will get me a healthy 6.5 enlargement resulting in a print size of 52”x65”. That scan will run about $125.00. Now I am at around $195.50 (minus shipping and taxes). Let’s add some shipping and taxes to be fair. The average shipping would be around $50.00 round trip for the developing and the same for scanning. Now I am at $295.50 for my one shot. Now the printing comparison. The maximum resolution from the Hasselblad digital back is 100 mega pixels. That equates to 8700 x 11600 pixels. Time for some math. To find the maximum print size, we must divide each of the pixel measurements by the resolution of the printer. My Epson printer requires 360 dpi. To be fair I’ll also use the more common 300 dpi resolution that most printers use. Why on earth Epson chose to use 360 dpi is beyond me. One of theses days I’ll send an email to the Epson mothership and ask them. Onward to the comparison. If I play by the rules of resolution, I can print that one image at a maximum size of 24”x32” using my Epson printer. That’s handy as my printer will handle paper that’s 24” wide. The same file would print at 29”x38” on a Canon printer. By now you must be asking the obvious question. Why am I using an Epson printer when a Canon printer will give me a larger print size? Hold on to that one, I’ll explain later. Now to the scanned film from the color transparency. The scanned file will produce a print size of 56”x70” on an Epson. The same file will print at 66”x83” on a canon printer. The maximum printer is 64”wide, so that print would actually be a few inches smaller. The smaller print size from the Hasselblad can be overcome by using pixel interpolation software. The software takes the image and makes a best guess as to how the image would look at a larger size using the current resolution. The key phrase here is at the current resolution. Adding resolution is never possible. The pixel interpolation software doesn’t add resolution, rather it simply digitally enhances the image to a larger size. The results are rather impressive, yet they fall outside of the default image size for my comparison of the Hasselblad H6D. I could play the same game and use pixel interpolation on my image from the scanned 8x10 transparency. Sooner or later both images will hit a point of diminishing returns. Thus far I am not seeing an advantage of using digital. The price of the Hasselblad H6D is $33,000. Add on the cost of a laptop, some lenses and supporting gear and we are topping out at just over $45,000. That a ton of film and scanning. The other option is to use an off the shelf digital SLR camera. The quality of the digital SLR is getting much better. That being said, the quality still falls short when compared to a sheet of 8”x 10” sheet film. So now to answer the question as to why I am using an a Epson printer instead of a Canon. My Epson printer is used to print my digital negatives. The largest digital negative that I ever print is 20”x25”. That works perfect as my UV vacuum frame that I use to print my gampi prints measures 24”x28”. There would be no reason from a larger print size to have a Canon printer. The others reason is that a Epson is designed to print both positive prints and negatives. Now to the reasons I shoot film that go beyond financial constraints. Using a large format film camera can often attract attention. People are mostly curious about the camera. Some want to know how many megapixels are in the camera. I never tire of hearing that one. Others are curious as to why I still shoot film. The answer is very much like my life. Simple, yet complicated. I started shooting film at the ripe age of 16. Doing any one thing for a long time can have a level of comfort and familiarity. Certainly, this is true for me. Holding a sheet of film makes perfect sense to me. Working with my hands to create an image is also part of the attraction of film. Plain and simple, I like the look of film. This opens the door of complexity. I was part of a film vs. digital discussion many years back. The discussion took place during the height of the film vs. digital war. I knew better, yet I agreed to participate. The conversation quickly took a nose dive. The question of the day was “why do you like to shoot film.” One of the artists answered the question with the following response. “I like the look of film.” The self-proclaimed leader of the discussion let it be known that this was not an acceptable answer. I felt like I had been hit with a ton of bricks. The answer was spot on. My suspicions that the leader was a film hater were now confirmed. It was now my turn to answer. I remained silent. I nothing to add. The cold stare that I received painted a very clear picture. I finally chimed in with what I felt was a logical and solid answer. “I like the look and feel of real grain. Not simulated grain from a cold and heartless piece of software applied to a digital piece of code stored in the grooves of a hard drive called up by a microchip.” That answer was met by a round of applause, and an even colder stare for the moderator. I was asked to leave. Curiously I was not invited back to the next meeting. I was not bothered by the fact that I was not welcome to attend future meetings. There is plenty of room for film and digital technology. The problem is the lack of understanding as to what film can offer. That and an overall level of hostility. Now to the reasons that I use film. This is a very brief overview. I could write many more pages on why I like to shoot with film. I still like the simple answer. I shoot film because I like the look of grain. Beyond that answer, here are a few other reasons. Panoramic Format – This is a big one. Shooting panoramic on the digital camera requires stitching many single images together. Stitching has become a very popular way (the only real way) to capture the panoramic image on a digital camera. There are a few basic problems associated with this technique. The main problem is that the subject cannot be moving. Consider a view of the incoming waves on the edge of the beach. This would not be possible to capture with stitching. The other problem with stitching is that of image distortion. The use of Photoshop has eliminated most of the distortion caused by stitching, yet some distortion can still be present. Overall, I like the ability to set up the camera and get one shot of the entire panoramic view. Perspective Distortion – The main benefit of a view camera is correcting image distortion. Pointing the camera up toward buildings is where the problem of distortion is commonly seen. That and the side views of buildings where the building seems to be exaggerated. The view camera has movements that will mostly solve those problems. The back portion of the camera (rear standard), is used to correct perspective distortion. By swinging the rear standard from side to side, or tilting it forward and backward, distortion can be corrected. There are practical limits, yet most of the distortion can be corrected. There are special view camera mounts for digital cameras that can minimize this distortion, but they are expensive and have practical limits. Varieties Of Film – The variety of films have never been so great. There are even new and improved emulsions available. My go to film for portrait work is Kodak Tri-X. Kodak first introduced Tri-X in 1940. In 2007 the design of Tri-X was improved. The down side to that improvement was the reduction in the amount of silver used. The reduction of silver was one of those cost saving measures that often comes with a redesign (Bad Kodak). I do praise Kodak for the tighter grain pattern in the new Tri-X. I’m still blown away at the quality and availability of Tri-X. 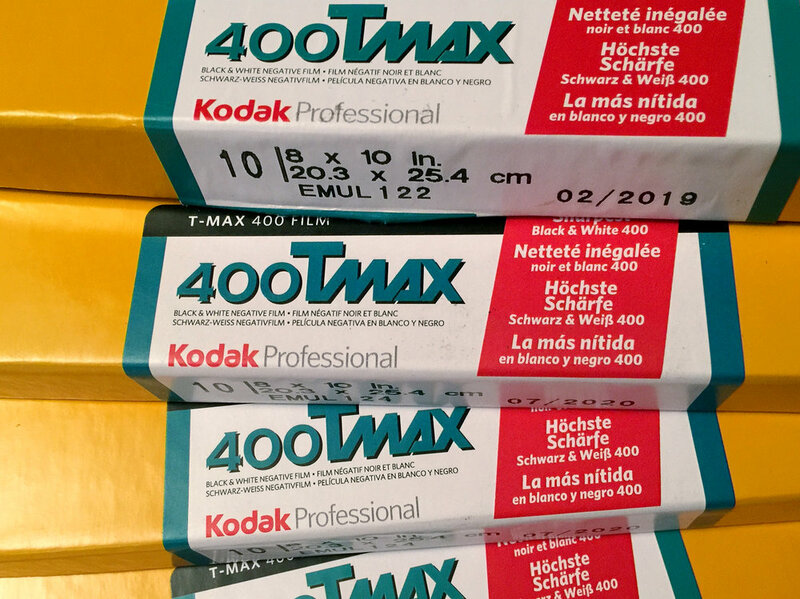 This is the single longest film production in the history of photography. The cult following of Tri-X is such that I cannot see Kodak pulling the plug on this film in my lifetime. The choice of developer is another factor. Tri-X is just one of a handful of films that can be altered by the choice of developer. How the film is developed is another deciding factor as to look and feel of the negative. The stand development technique will push any film to the technical edge. Stand development is basically a method of leaving the film in a special developer for up to an hour. The result is an increase in acutance (sharpness) with no loss of grain. The film grain tends to swell the longer the development time. Stand development overcomes that problem. This is why stand developing is popular. Flexibility – This is more related to shooting sheet film in a large format camera. Sheet film is loaded into sheet film holders (clever name). Each holder is double sided and holds one sheet per side. This allows multiple types of film to be shot, one piece of film at a time. The ability to develop each sheet differently is a huge factor here. The smaller roll film cameras often have film backs that take up to 15 images per roll. Each film back can be used for a different type of film, yet the development is the same for the entire roll. This becomes problematic when the lighting conditions dictate how long the film is developed. A classic example is when the highlights are blown out on some images on the roll and not others. Development time impacts highlights. Hands On – The ability to hold a physical negative is something that I never get bored with. In 100 years, my negatives could very well be stuffed in a dusty old box on the back shelf of an antique store. Just like the glass plates from the 19th century, the negative preserves history. To say that the content of the subject matter on my negatives are historic might be on the side of arrogance. The real point is that people love to see the history in some type of physical form no matter how dull the subject matter. Simplicity – My first camera was a 35mm Nikon F2AS. I still have it, yet it does not function properly. I printed every roll of developed film from that camera as a contact print proof sheet. The term contact print comes from placing the negative in direct contact with the paper and exposing to light. Contact proof sheets are still a popular way to see each image without enlarged proofs. Pulling a proof sheet is fast and often used for future reference to see the negatives in a positive form. I would do the occasional enlargements, but not before pulling a proof sheet. Looking at a proof sheet is one sure way to peek into the mind of the photographer. All images are there for anyone to see. I’ve actually seen some proof sheets with images that have been cut out with a pair of scissors to hide mistakes. As my negatives increased in size, the contact print became my final print. I personally never owned an enlarger, and seldom used one. I started doing enlargements with digital negatives for my palladium prints in the spring of 2010. Now I am coming full circle and pulling silver gelatin (traditional black and white prints) from some of my negatives. The ability to print a negative without the use of an enlarger is about as simple as it gets. Zen Approach – This is one of those things that is most difficult to explain. Much like the saying, if I have to explain it to you, you won’t understand it. I compare this one to explaining why I enjoy the comfort and serenity of a ride on a Harley Davidson motorcycle. Impossible to describe. Very possible to show. Using film forces me into a slow and methodical approach. There is no immediacy. The negatives must be developed by hand in a tray of developer in complete darkness. Over the years this approach has helped me to focus on the details in life, yet I still look for my car keys every few days. Shooting film improves my situational awareness. I also like looking at a dozen 8x10 negatives clipped to wire clothes hangers drying in my darkroom. Shooting film is not for everyone. Much like the saying, if it was easy, everyone would be doing it. Over time I have learned to embrace the tools and techniques that make life easier. This is even more true for the methods that I use to create my palladium images. Scanning my negatives is the only way that I can satisfy my picky requirements. If I were younger and just starting to shoot, I would go digital for sure. Maybe some chance encounter with a film shooter might sway my opinion of film. The younger generation of digital photographers are now discovering film. The greatest benefit of this is that there are still choices. One can shoot both film and digital. There is simply no right or wrong way here. I would never ask anyone using a digital camera to abandon the technology over film. That is simply not practical, nor realistic. My advice is and has always been to give film a try.The nature of film just might surprise you.